Google released Panda 4.0 today, May 22nd 2014. At first glance, it appears as if websites that were borderline have improved in rankings which tends to indicate that the latest version of Panda is actually more gentle than it’s predecessor. Matt Cutts announced the news on his twitter page which has resulted in everyone with a website to check their Google Analytics stats and load up their favorite ranking tool to verify if they were still in position #1 for their keywords. With Panda, Google uses a set series of quality indicators in order to determine the quality score of a website. Websites are then evaluated based on elements such as user experience, layout, content and specific quality checks. The most important aspect of Panda is the user experience and this remains a constant even with the release of Panda 4.0. Google’s goal is to satisfy the user’s query. It evaluates how previous visitors react to a certain website in order to determine if future users will enjoy your website. This website was positive affected by Panda 4.0 and has recovered most of it’s traffic. With this latest update, it appears as if the requirements for a higher quality score has been lowered, making it easier for sites with borderline site quality to rank. This is exciting because our latest findings show that our quality techniques are working even better than before! Have you experienced a traffic increase? 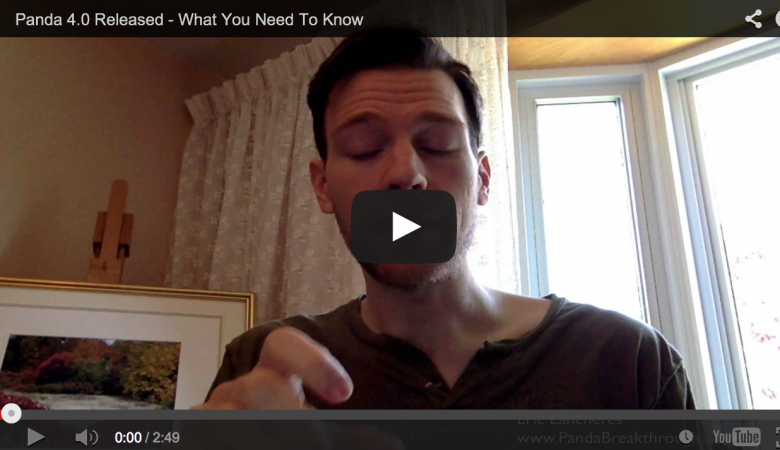 Do you have additional information regarding Panda 4.0?